Its very name tells us it's unpleasant: small intestinal bacterial overgrowth. A SIBO diet, though, can ease symptoms (bloating, cramps, diarrhea...). A SIBO diet will help relieve such symptoms as bloating, gas, cramping, and diarrhea. The health-conscious among us will be aware of this simple fact: The health of your body depends on the health of your cells. You will also be aware that your lifestyle and diet can significantly impact the health of your cells. 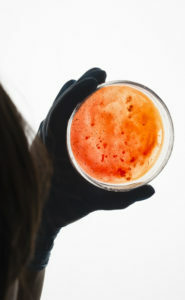 But did you know that around half of the total number of cells in your body are bacteria? Yes, half! A fact confirmed by 2016 research. So it goes without saying that the health of your body—and in particular your gut—depends on the balance of these bacteria. The term used to describe the bacteria in the body is microbiome. More than half of the total cells in our body are bacteria. Within this “microbiome,” there are “good” and “bad” bacteria; your good health can hinge on the balance. The bacterial populations in the gastrointestinal tract (gut) affect not only the health of your gut, but also the health of every system, organ, and cell in your body. The gut microbiome contains tens of trillions of microorganisms; these come from more than 1,000 different species. And each of us has our own unique microbiome. What Is SIBO—and What Are the Symptoms of SIBO? The small intestine is composed of the stomach, duodenum, jejunum, and proximal ileum. This area of the gut was once believed to be sterile (free from bacteria). The mainstay of medical treatment for SIBO is treating underlying conditions (such as Crohn’s or diverticulitis), antibiotics, dietary change, and prebiotic supplementation. Rarely, SIBO sufferers require hospital admission and IV fluids. A small study in 2014 set out to “determine the rate of SIBO using either the antibiotic rifaximin or herbals in a tertiary care referral gastroenterology practice.” The study concluded that a formulated herbal therapy was “as effective as triple antibiotic therapy for SIBO rescue therapy for rifaximin non-responders.” However, more research is needed. Dietary change is recommended to most people with SIBO. A fascinating article in the journal Gut and Liver in 2017 explains that these troublesome bacteria thrive on certain carbohydrates such as lactose, fructose, and the group called FODMAPS (fermentable oligo-, di-, monosaccharides, and polyols). When you ingest these foods, they are fermented by the bacteria, producing gas (just like home-brew beer), resulting in flatulence, abdominal bloating, and pain. Gut Liver reported that “restriction of these dietary components may improve these symptoms. Moreover, some preliminary data suggest that manipulation of the diet may alter gut microbiota.” They also recommend taking a probiotic supplement (one that contains “good” bacteria). The aim of dietary change is to reduce the intake of foods the bacteria thrive on. The big problem is that it isn’t obvious or intuitive as to what these foods are; many of them are usually considered healthy. Plus, because each of us has our own unique microbiome, foods that give most sufferers unbearable symptoms may be just fine for you. Your primary care physician or gastroenterologist may be able to give you some information on dietary change or he may recommend that you see a dietician or nutritionist. There is a lack of consensus as to what is the best diet for SIBO, but most recommend reducing carbohydrates, excepting insoluble fiber. Examples of formalized diets include: the Low Fodmap Diet (LFD), the Specific Carbohydrate Diet (SCD), the Gut and Psychology Syndrome Diet (Gaps Diet), and the Cedars-Sinai Diet. Discuss with your doctor before starting any of these diets and don’t follow them if you do not have SIBO. The FODMAP diet is the best researched of all of these diets and is widely accepted by the medical profession. It was developed by researchers at Monash University in Australia. Stage 1 Restriction: Avoid High FODMAP foods for four to eight weeks. Stage 2 Reintroduction: If symptoms have improved, reintroduce foods slowly and track symptoms. Stage 3 Personalization: Create a personalized diet to avoid trigger foods. Products, including candy and gum, with sweeteners ending in “–ol,” such as sorbitol, mannitol, xylitol, and maltitol. 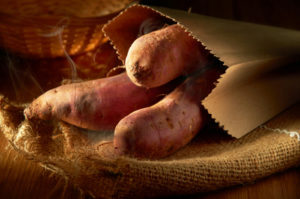 For a SIBO diet, keep such standbys as sweet potatoes, vegetables, rice, and bread on hand. Be careful with fruits—there are some that are safe, but others you should avoid (see lists in text). There are two types of fiber in food, soluble and insoluble—and we need both. Soluble fiber draws fluid into your digestive tract and slows digestion, allowing the gut time to absorb vitamins and minerals from food. Insoluble fiber, on the other hand, does not draw fluid into the gut and passes through quickly, bulking out your stools and making them easier to pass. SIBO bacteria don’t thrive on insoluble fiber. SIBO and SIBO diets all sound rather daunting and confusing, we know, but the good news is that there are several phone apps that can help you identify potential trigger foods; some also help you track symptoms. Vegetables (5-6 servings/day): Try carrots, zucchini, green beans, squash, pumpkin, lettuce, cucumber, and sweet potato. Bread, cereals, rice, and pasta (4-6 servings/day): Try gluten-free or spelt bread, white or brown rice, and gluten-free pasta. Fruit (at least 2 servings/day): Try oranges, banana, kiwi, berries, grapes, pineapple, or rhubarb. Meat, fish, poultry (2-3 servings/day): Try chicken, turkey, fish, eggs, nuts, and seeds. Milk, yoghurt, cheese (2.5-4 servings/day): Try milk, lactose-free milk (if you are lactose- intolerant), and ricotta or cottage cheese. Fats and oils (limited): Limit oils, margarine, biscuits, cakes, pies, and alcohol. 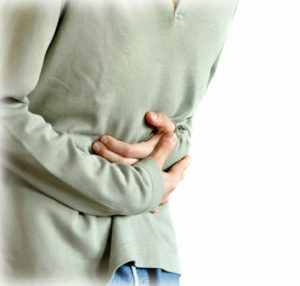 SIBO symptoms, abdominal bloating, abdominal pain, alcohol, antibiotic therapy, antibiotics, bacteria, beer, best diet, bloating, carrots, cauliflower, corn, corn syrup, cramps, dairy, dehydration, diarrhea, diet, digestion, digestive, digestive tract, diverticulitis, dysbiosis, fiber, fodmap, food, foods to avoid, garlic, gastroenterology, gastrointestinal, gluten, gluten free, gluten free pasta, good health, gut bacteria, gut microbiome, health, herbal therapy, high fructose corn syrup, honey, infection, joint and muscle pain, liver disease, long periods, maltitol, milk, muscle, muscle pain, natural medicine, nuts, osteomalacia, osteoporosis, pain, potatoes, probiotics, rhubarb, sibo, sibo diet, spelt bread, stress, sugar, supplement, the best diet, unexplained weight loss, vegetables, vitamin, vitamin deficiency, vitamins, vitamins and minerals, yogurt. I have sibo & everyone’s bacteria are diff….I can have alcohol biscuits cakes pies but very small portions & I get no reaction on the other had red meat destroys me gotta listen to your body. Great summary, but constipation needs to be added as a symptom, especially for those patients with methane based SIBO. Um.. they said to LIMIT those things. Gotta read. Just diagnosed with sibo and there is so much conflicting info on what you can have. So basically rice, meats, broths, hard cheeses, and green crunchy vegetables. I am just not messing around with the legumes or fruits or other dairy. Also need to list weight GAIN as a symptom too. It happens when the body goes into starvation mode.